We’re sending a big THANK YOU to Canandaigua National Bank and Trust! CNB employees raised $1,278 in support of Heart Month and RRH’s Sands-Constellation Heart Institute. How did they do it? CNB employees sold heart ribbons in all branches and also raised money by hosting a dress down day. 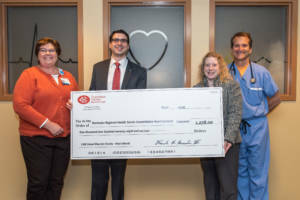 RRH is grateful for our partnership with CNB and its commitment to our community! Posted April 13, 2018 under _Featured Stories List, News.